ARLINGTON, VA. 23 FEBRUARY 2015. The National Genealogical Society (NGS) today launched NGS Monthly, a new digital publication that, each month, will feature a selection of original articles on genealogical methodology, research techniques, sources, and the latest news from NGS. Published mid-month starting after the February launch, NGS Monthly was created to replace the Society’s older newsletter, What’s Happening, with a new content and design strategy. NGS Monthly has a cool, clean look with predominantly green and white graphics and a lean design strategy to avoid distractions. “What’s Happening was using an older delivery system that limited the Society in terms of layout, graphics, readability and enjoyment. 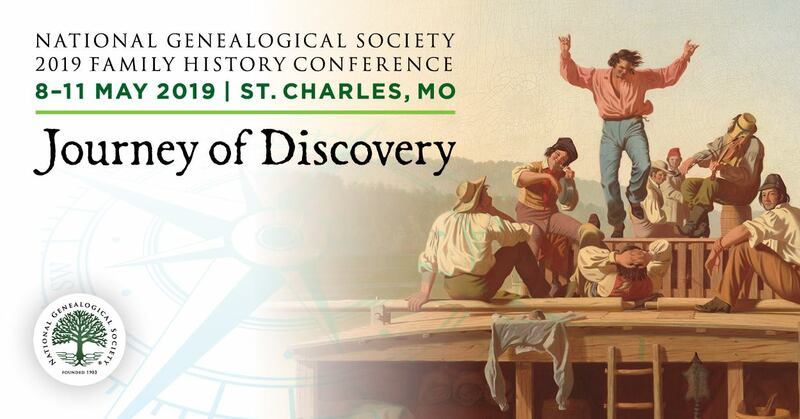 We wanted to provide our members with a more pleasant experience that will include visuals and varying lengths of articles, plus social media access,” said Jordan Jones, President of the National Genealogical Society. The new content strategy has at its core the decision to give readers two thoughtful, longer-length original articles each month. One article in NGS Monthly will be devoted to genealogical methods and tie back to a past article in the digital archive of the National Genealogical Society Quarterly (NGSQ) to give the reader examples from case studies. The concept is to “deconstruct” scholarly work so that genealogists of all levels can benefit from analysis of the fine work in this premier journal. “There are many media options on the genealogical landscape today. NGS wanted to provide something special, something that could bring new understanding to the components of really excellent work that many of us aspire to and look at how expert writers handle sources, information and evidence to build proof of relationships,” explained Terry Koch-Bostic, Chair of the NGS Communications and Marketing Committee. Articles that are reflective about methodology and others providing readers with new insights, combined with NGS updates and news stories, form the core content strategy for NGS Monthly. The new format also encourages members to share news items through social media and gives them easy access to the NGS homepage, Twitter feed and Facebook page. There are also useful links to the digital archives for NGS Magazine, NGSQ and Upfront with NGS. 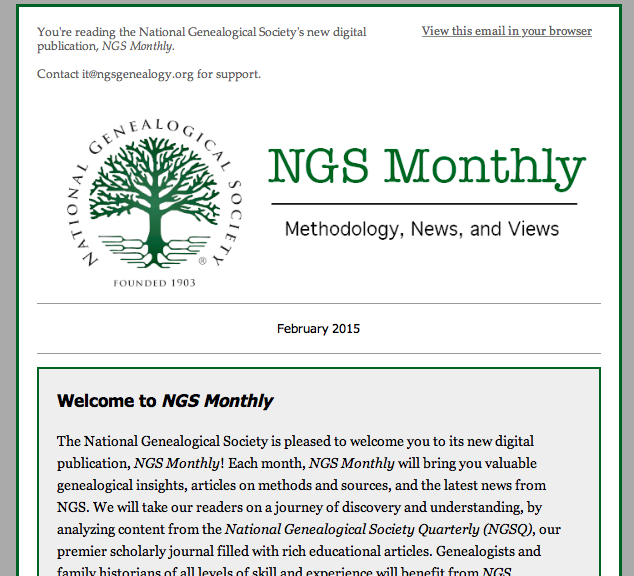 A subscription to the digital publication, NGS Monthly, is provided as part of a paid membership in the National Genealogical Society along with subscriptions to the National Genealogical Society Quarterly, NGS Magazine and Upfront with NGS blog. Upfront is also available free to subscribers. For more information on NGS Monthly and these other fine publications, visit www.ngsgenealogy.org.